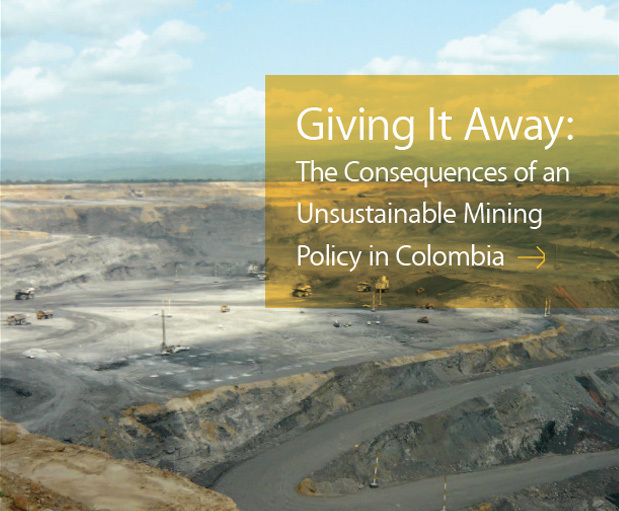 Mining in Colombia has been singled out to be one of the major drivers of economic growth for the Colombian economy, and yet this report reveals that in the case of coal, the Colombia Government was actually giving it away in 2007 and 2009. The lack of an effective and transparent tax system in Colombia has resulted in some multinational corporations making more from tax exemptions than they pay in corporate income taxes and royalties. With the proposed new Tax Bill, rather than raising income tax for mining corporations, the government plans to cut it from 33 per cent to 25 per cent.With the goal of doubling coal exports and tripling mining generally by 2021, Colombia risks giving its natural resources away at immense social, environmental and human rights costs if it does not revise its tax regime. Furthermore, the findings of this report reveal that government policies aimed at rapidly expanding natural resource extraction through Foreign Direct Investment (FDI) conflict with policies on the protection of ecologically sensitive areas, the rights of peasant farmers (campesinos), Indigenous and AfroColombian Peoples, land restitution and the protection of areas for agricultural use. This report is written in the context of a rapidly expanding Colombian mining industry and increasing European investment in mining in Colombia. Furthermore, it is being launched at a time when the United Kingdom (UK) has been promoting the UN Guiding Principles on Business and Human Rights. Given the UK has taken the positive step of piloting the development of a Colombian Strategy on these principles with the Colombian Government, it is hoped that this report and its recommendations can feed into both Colombian and UK strategies. Colombian economic policy is based on the extractives industry being one of the major locomotives pushing economic growth over the next decade. However, this policy has been promoted in the context of an ongoing internal conflict and human rights abuses, including forced displacement. Despite the ongoing nature of the conflict, the government has passed a transitional justice law to restore approximately 2.2 million hectares of approximately 6.6 million that has been usurped or abandoned during the conflict.The drive to have Colombia known regionally as a mining country is being undertaken before land restitution policies have been implemented, increasing the difficulty of returning stolen lands to those who have been forcibly displaced.